The rubble of twisted concrete and metal bakes in the hot Mediterranean sun of a regional heat wave. Thirteen-year-old Hula Khadoura sits on a large sofa in her grandfather’s home in the neighbourhood of Tuffah, Gaza City, her one-year-old twin brothers Karam and Adam on her lap. “I am so happy they arrived,” she beams, holding the babies’ feeding bottles in her hands. Secretary-General Ban Ki-moon, reportedly under heavy pressure from the United States and Israel, has decided not to blacklist the Jewish state in an annex to a new U.N. report on children victimised in armed conflicts. Three Palestinian fishermen were injured last week after Israeli naval forces opened fire on fishing boats off the coast of al-Sudaniyya in the northern Gaza Strip, bringing to 15 the number of farmers and fishermen shot and injured by Israeli security forces recently as they attempted to earn a living. The U.N. investigation into Israel’s devastating military campaign against Gaza, from July to August 2014, has been delayed until June and in the interim Israel and the Palestinians are waging a media war to win the moral narrative as to why so many Palestinian civilians were killed during the bloody conflict. This year, Arab political Islam will be greatly influenced by U.S. regional policy, as it has been since the Obama administration came into office six years ago. Indeed, as the U.S. standing in the region rose with Obama’s presidency beginning in January 2009, so did the fortunes of Arab political Islam. The UN agency for Palestinian refugees has launched an ambitious recovery plan for Gaza following the 50-day devastating war between Hamas and Israel which has left the coastal territory decimated. The son of one of the founders of the biggest Palestinian militant group decides to work with Israel. He spends a decade working undercover with the Israeli security service, the Shin Bet, thwarting dozens of Palestinian attacks and contributing significantly to the arrest or elimination of dozens of leading Palestinian militants. Israel and its supporters abroad have parried accusations of indiscriminate destruction and mass killing of civilians in Gaza by arguing that they were consequences of strikes aimed at protecting Israeli civilians from rockets that were being launched from very near civilian structures. Secretary-General Ban Ki-moon, in a rare moment of political candour, lashed out at Israel last week, questioning its "respect for the principles of distinction and proportionality" - particularly in the context of the civilian death toll that kept rising to over 2,000 Palestinians, with more than 75 percent civilians. As the dust - and the gunpowder - settles after the month-long devastating conflict in Gaza, there were apparently no victors or vanquished. 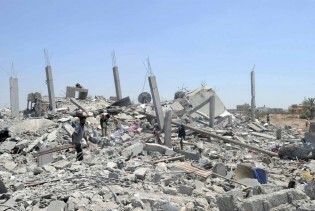 United Nations officials and human rights organisations have characterised Israeli attacks on civilian targets during the IDF war on Gaza as violations of the laws of war. There is an age-old axiom in politics, says a cynical Asian diplomat, that you don't bite the hand that feeds you. “Strong together, we love Israel and trust the army” – while a tentative truce takes root, banners adorned with the national colours still dominate cities and highways across the country. When world political leaders met at the United Nations back in 2005, they unanimously adopted a resolution affirming the principle of "Responsibility to Protect" (R2P), aimed primarily at safeguarding innocent civilians from war crimes, genocide, mass atrocities and ethnic cleansing. Pro-Israel activists assembled a huge crowd and a long list of congressional leaders and diplomats to declare their unconditional support for Israel’s military operations in the Gaza Strip on Monday, largely downplaying tensions between Jerusalem and Washington. As the killing and destruction rages on in Gaza, and as Israeli Prime Minister Benjamin Netanyahu and the Hamas leadership exchange recriminations and threats, key regional and world players must accept a central truism: No peace can be achieved between Israel and the Palestinians without including Hamas. The quicker they internalise this fact, the faster the cycle of violence can be broken. The overwhelming Israeli firepower unleashed on the Palestinian militant group Hamas in the ongoing battle in Gaza is perhaps reminiscent of the Algerian war of independence (1954-1962) when France, the colonial power, used its vastly superior military strength to strike back at the insurgents with brutal ferocity. As a result of over two weeks of Israeli bombardment, thousands of Palestinian civilians have fled their homes in the north of Gaza and sought refuge in schools run by the UNRWA, the U.N. agency for Palestinian refugees.